NGC 2024 (also designated as Sh2-277) is commonly referred to as the Flame Nebula. It is an emission nebula that lies approximately 1,350 light years away and contains 800 very young stars. It gets its defining charactertics from the dark nebula that partially obscures it. This is part of the Orion Molecular Cloud Complex that includes the Horsehead Nebula (which is just off the frame at the lower right) and the Orion Nebula. The bright star to the right of the nebula is Alnitak (Zeta Orionis), the eastern-most star in Orion's belt. 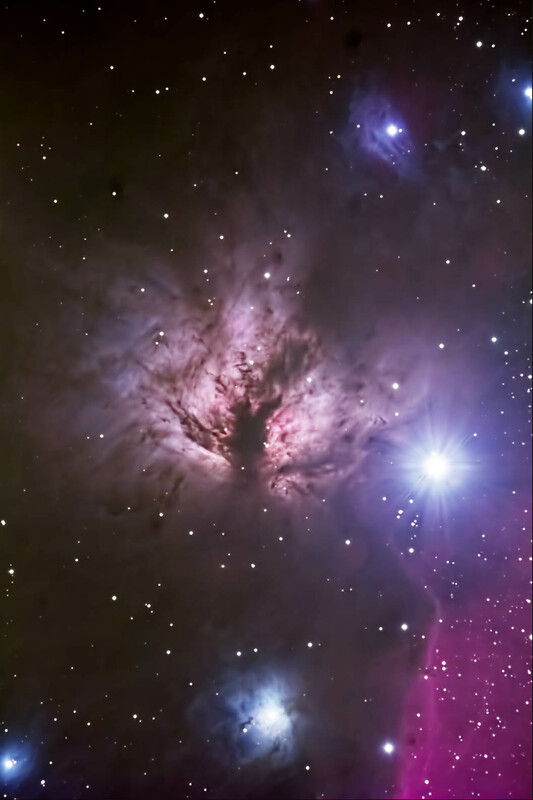 The relfction nebula a the upper right is IC 432 and the one bottom center is NGC 2023. Telescope was focused using the camera's live view and Bahtinov mask. Raw frames were converted in Photoshop using Camera Raw. Subframes were aligned and combined in ImagesPlus. The final image was adjusted in Photoshop. Topaz Detail and DeNoise were applied. Taken from my backyard observatory in southeastern Minnesota on 2/11/18. Temp: 8 F. Seeing was average.